It’s all systems go here in Sydney with the commencement of The Championships, probably seen as Australia’s version of the Breeders’ Cup Carnival, and the Inglis Easter Sale, similar to Saratoga in August or Keeneland in September. It is a terrific two weeks for not only those who work in the horseracing industry, but for all racing enthusiasts. 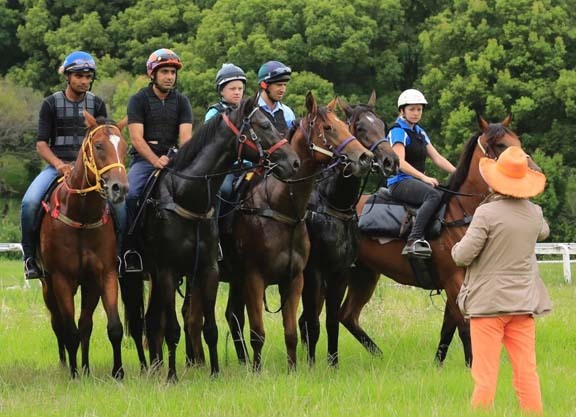 After attending trackwork on Tuesday, to watch my Championship contenders be put through their paces, I kicked off my initial sales ground inspections for the Easter Sale. Of course, I have seen many on the farms over the past few weeks so over the next couple of days I will target those consignments that I did not have the pleasure of visiting. Following that, a ‘long, shortlist’ will be created between me, my veterinarian, assistant trainer and bloodstock agent. These will make up my second looks. If a yearling makes it past this point, they are on my shortlist and X-Rayed. As I am sure you can imagine, time is of the essence during this period, but one thing I have learnt over the years is that attention to detail is paramount, whether it is choosing the next champion at the sales ground or training the next Group 1 winner, both of which I will be aiming to do in the coming days. The Inglis Easter Sale showcases some of the best pedigrees in Australia, many of which are international. This year five of Frankel’s yearlings will go under the hammer. I had the pleasure of visiting boutique stud farm Strawberry Hills only a week ago, where I laid eyes on my first Frankel. The colt is out of More Strawberries, who is of course by More Than Ready, who raced and stands in the U.S. at one of the leading stud farms, WinStar. More Strawberries herself was a multiple Group 2 winner and a half-sister to Group 1 winner and current sire, All American. This is the family of GI Santa Anita H. winner Rock Hard Ten. More Than Ready produces wonderfully tough, versatile racehorses, most notably my eight-time Group 1-winning mare More Joyous, and champion 2-year-old colt, Sebring. The catalogue is studded with interesting international pedigrees and it has certainly whetted the appetite of bloodstock agent Marette Farrell and Eclipse Thoroughbreds’ Aron Wellman. I had the pleasure of meeting Aron and Eclipse Chairman Brian Spearman when my husband and I headed to Saratoga last August. After breakfast at The Reading Room in Saratoga, Aron and Brian started to hatch a plan to come to Australia and when they saw the catalogue and spoke with Marette, they realized it was an opportunity of a lifetime. Aron is young, enthusiastic and passionate, which is imperative for success, and Eclipse Thoroughbreds are a syndication company going places. Only last weekend their mare Curalina was honoured as the 2015 Aiken-Trained Horse of the Year and I have no doubt that there will be many more future champions on their roster. The racecourses are very much around the city centres, Sydney and Melbourne boast four tracks each within a 20km radius. Not only that, my stable is in spitting distance from Botany Bay, where the horses go each day to swim alongside one of Sydney airport’s runways. It can be quite the surprise for visitors when they look out the window of the aeroplane and realise they are racing one of my horses to the shore. For me, I love the enthusiasm that my overseas owners show for the sport. It is always a sunny day when I call the U.S. with updates on the horses. They are enthusiastic and constantly looking for the upside, and I for one will continue to encourage investment in Australian bloodstock and keeping a close eye on opportunities across the pond.